A locally abundant, but range-restricted subspecies (EOO, AOO <1 km²) that is potentially threatened by succulent collecting and habitat degradation. 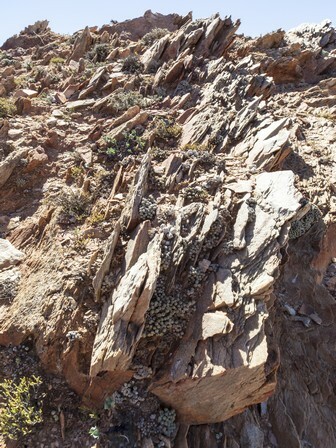 Vertical fissuers in quartz ridges in sheltered kloofs in Lekkersing Succulent Shrubland. This taxon is potentially threatened by succulent collecting. It is not highly-sought after, and hence not particularly targeted by collectors, but the subpopulation occurs in an easily accessible site, next to a road, and may be targeted by opportunistic succulent collectors, which are clearing out many areas in the Richtersveld of their succulent plants (P.C.V. van Wyk pers. obs.). In addition, this site occurs in an area severely degraded as a result of livestock grazing. This taxon is not grazed, and its particular habitat offers it some protection against the effects of erosion and trampling. However, overgrazing has significantly reduced shrub cover in large parts of the Richtersveld. This taxon is shade dependent, and individuals exposed to direct sunlight as a result of a loss of shrub cover may suffer. Most plants are however sheltered by rocky overhangs, and is not particularly vulnerable to loss of nurse-shrubs. Locally very abundant in suitable habitat. Population size estimated to be more than 5000 plants.